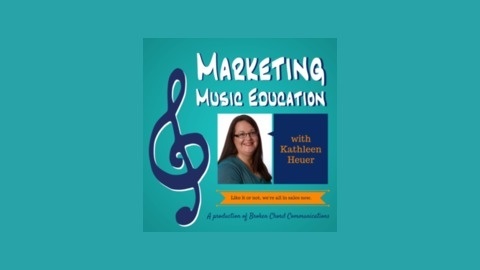 Marketing Music Education is THE podcast that encourages music educators & boosters to use simple tools and tactics to increase the reach, influence and “relentlessly positive” perception of their programs. 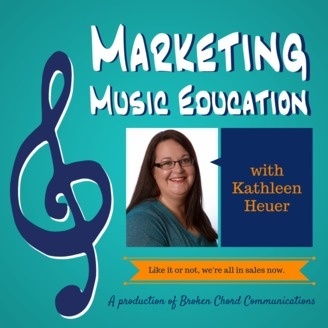 In addition to tips and tricks, I’ll also feature other topics and guests that affect the world of music education. In a world where we're all waiting for the next budget battle axe to drop, the techniques you learn here will strengthen the armor that protects the program you've worked so hard to build. In this episode, Kathleen’s guest is Mac Smith, the founder of Gigantic Cranium, an independent film production outfit. Along with Tom Tollefsen, Garrick Gonzalez, John “JT” Torrijos and the other members of the team, they produced the documentary film about the Madison Scouts drum and bugle corps—Scouts Honor: Inside a Marching Brotherhood. Mac’s family frequently brought him to movies and it was in 1977, when he watched Star Wars, that he decided that he wanted to make movies when he grew up. He experimented with video cameras and editing throughout his childhood. At 17, he attended the Summer Production Workshop at USC Film School. He studied film and also auditioned for the Madison Scouts Drum & Bugle Corps and marched for one year. He was the Music Director at the University of Iowa College radio station, KRUI, when he decided to start his career in sound editing for movies. He has worked on post production sound for over 75 films and was nominated for 10 Golden Reel Awards. Mac is grateful to his team, especially Tom Tollefsen, Director, Co-Producer for the success of their Scouts Honor movie. Mac talks about his life in the Bay Area with his wife Ashley, his son Admiral, and daughter Maven. Mac Smith (documentary filmmaker and sound designer) was born into a family of tuba players in Omaha, Nebraska. His parents and older siblings exposed him to films that were a bit mature for his age, and a wide variety of musical styles. Films that stand out from his early childhood are “Murder By Death”, “Monty Python and the Holy Grail”, and “The Blues Brothers”. It was on that fateful day when his parents took him to see “Star Wars” in the theater in 1977 that changed it all. After that viewing, Mac knew that he wanted to make movies when he grew up. Mac experimented with video cameras, and picture editing throughout his childhood. He went off to Los Angeles at age 17 to take the Summer Production Workshop at USC Film School, and then made his home in Iowa City at the University of Iowa. Mac marched in the sousaphone section of the Hawkeye Marching Band, and studied film at Iowa. During his time in Iowa City, Mac decided to audition for the Madison Scouts drum & bugle corps in Madison, Wisconsin. He marched as a contra player for only one year due to age eligibility in 1995. The lightbulb really went off for Mac when he got his hands on early digital audio editing software while he was the Music Director at the University of Iowa college radio station, KRUI. This is where sound and picture came together in his mind. The decision was made to start his career in sound editing for movies. Within a year of moving to Northern California, he found his way into the movie industry. Mac has worked on post production sound for over 75 films (“Dawn of the Planet of the Apes,” “The Birth of a Nation,” “Toy Story 3,” “Tron Legacy,” “Rango”) and has been nominated for 10 Golden Reel awards (Motion Picture Sound Editing). In 2011, Mac and Tom Tollefsen started developing the concept of a documentary film that focuses on the drum corps activity that they wanted to direct and produce. The film, “Scouts Honor: Inside a Marching Brotherhood” screened at four film festivals from 2014 to 2015 and took home 3 awards. Through the “Theatrical on Demand” company Gathr, “Scouts Honor” screened in nearly 30 theaters around the USA in 2015 and 2016. In June, the film was released on DVD and Bluray and now it’s coming out on iTunes on November 8th. Mac enjoys living in the Bay Area with his wife Ashley, his son Admiral, and daughter Maven. The post Mac Smith of the Scouts Honor documentary appeared first on Kathleen Heuer.